Even as the buzz gets louder of the government wanting Apple to manufacture in India, company CEO Tim Cook, on his first trip to the country, is likely to seek an assurance on intellectual property rights when he meets Prime Minister Narendra Modi on Saturday. This will be the third and final leg of the 55-year-old Cook’s visit to India, after Mumbai, Hyderabad and Kanpur. 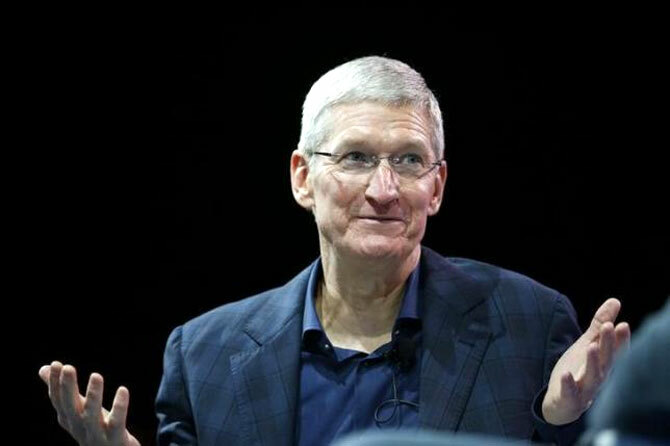 But it is Cook’s much-anticipated meeting with Modi on Saturday that is being tracked by all tech majors. Industry executives who have been following the Apple CEO’s visit so far surmise that IPR will be a discussion point even as Modi raises his pitch for Apple to make in India rather than import and sell refurbished phones, something the government is not in favour of. The government has twice rejected Apple’s application to sell refurbished smartphones in the country. Cook, in his defence of the refurbished iPhone programme, is likely to raise the IPR point as a possible counter to making in India just yet even as the long-term plan of the company will be to shift manufacturing from China, which no longer enjoys significant cost and labour arbitrage, industry sources say. When contacted, an Apple India spokesperson did not comment on the matter. The government last week unveiled a National Intellectual Property Rights policy to promote creativity, innovation and entrepreneurship. Companies in sectors like consumer goods, pharmaceuticals and electronics have repeatedly complained of counterfeiting and weak enforcement. In 2015, India ranked 29 out of 30 countries in the International IP Index released by the Global Intellectual Property Centre of the US Chamber of Commerce. While China was ranked higher at 19 on the same list, it offers no consolation to Apple, say industry sources. According to Neil Shah, an analyst from CyberMedia Research, local manufacturing of handsets lowers their cost by eight per cent. The Modi government last July extended manufacturing sops under the Modified Special Incentive Package Scheme (M-SIPS) in an effort to boost local production. A slew of companies have since expressed their interest to make in India. Some of them, including Apple, are planning to set up their branded stores in the country. In Apple’s case, the government is open to waiving local sourcing norms needed for those applying for a single-brand retail licence.